Have you ever wondered how it is possible for an individual, who has never been exposed to Jews nor any aspect of Judaism, to feel an inner stirring towards Judaism and the land of Israel? How is it possible for a young woman who grew up in a Muslim country, where she heard only negativity and anti-Semitic slogans against Jews to feel a deep connection to Yiddishkeit? I would like to introduce you to “Rachel”. 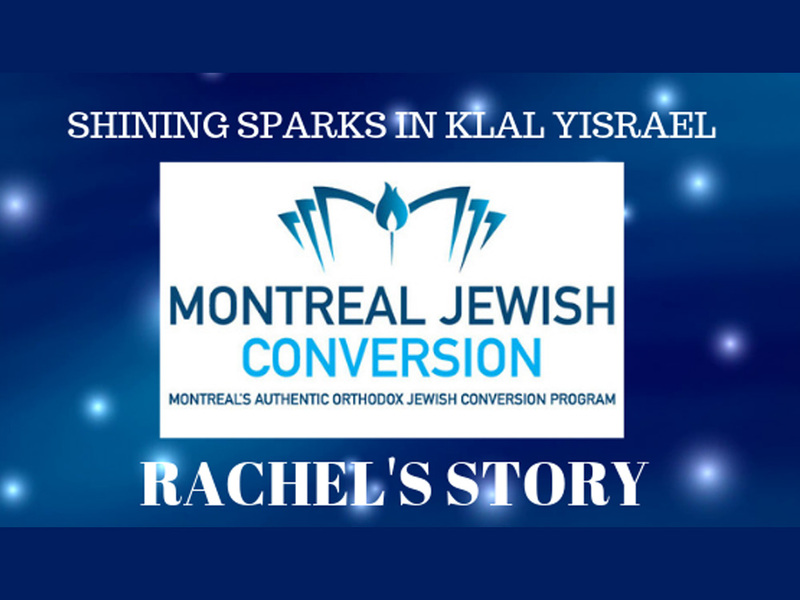 Her journey to Judaism and subsequent orthodox conversion at the Jewish Community Council of Montreal is sure to inspire many born Jewish. I was born in Iran and arrived in Canada in 1997 at the age of 14 with my grandmother and brother. I followed my sister who had married a Canadian. Life was challenging for me especially because I knew no English. We were taught to persevere from a very young age. Growing up in Iran, I recall vividly, how at the age of six I would race to the basement when we heard the bombing (war between Iran and Iraq) and put steaming compresses on our faces to prevent us from getting boils in case the chemicals used in the bombs rained down on us. At the age of 17, I started to meet my first Jewish friends who introduced me to soul stirring Israeli music. I could not make sense of what I was feeling, however, I was attracted to the words and the power of the Jewish melodies. As I went about my daily life, I found myself drawn towards Jews and always seemed to be able to single out those who were Jewish in whatever setting I was. I always gravitated to Jews and immediately felt comfortable and connected. It was as if there was an inner magnet constantly pointing me in the same direction! Years passed and I kept ignoring the stirrings within and yet that small voice began to grow louder. I would ask myself, “Why am I so interested in Israel and the Jewish people?” I began to research other religions. Christianity did not talk to me. I dated a Christian- Lebanese man who wished to marry me on condition that I would commit to stop listening to Jewish music. I knew that would not happen. over. Jews were banned from parts of the city and forced to wear Jewish identification on their clothing. Hundreds of leading Jews were coerced to take on Muslim names and convert to Islam. Outwardly, it seemed that this was the end of Mashadi Jews, however in secret, many continued to observe Jewish rituals much like the Marranos in Spain and Portugal. Hence, I began to ponder whether my roots were in fact Jewish! Upon questioning my parents, I learned that my maternal grandfather had changed his name from “Sharifi”, a known Persian Jewish name. My grandmother tried to convince my grandfather to connect more to Islam. He refused…I still do not know why. In 2010, I decided to follow my dream and attempt to make my way to the Land of Israel. I knew that this journey would involve great sacrifice. My father had remained in Iran and journeying to Israel would now ban me from re-entry to Iran. My love for the people and the land of Israel prevailed. At this point I had not yet considered conversion and a small part of me still felt that perhaps this phase would indeed pass. Perhaps my trip to the Jewish homeland would satisfy me enough and silence the voice within. It turned out to be quite the contrary; there was no going back. My heart and soul had been ignited. Neither Israeli music nor meeting Jewish acquaintances would come close to fulfilling my deep-rooted desire to connect and learn more. My Jewish acquaintances suggested that they knew a simple route to convert to Judaism. I argued, “I am not looking for the easy, short route. I want 100% authenticity.” My decision to pursue an Orthodox conversion at the Va’ad Ha’ir Jewish Community Council Beit Din was my first step in leaving my personal “mitzrayim”, my personal exodus from Egypt. At first, my classes were challenging. I had to get comfortable in my new setting. It did not take long and I began to absorb the words that I was hearing. I felt as if the truths of Torah were like a current of water rushing over me and quenching my parched soul. I began to get answers to my questions. I gained deeper understanding and perspective of concepts that I had been learning on my own through “shiurim” (classes) that I had listened to online. One such concept for example was “ahavat yisrael” (love of fellow Jews). I had felt it for years but now I understood that this was a concept inherent within every Jew and on a deep level I was connecting to it. Hashem had given me this feeling prior to even being able to identify it. When I learned about Rosh Chodesh (new month) and the waxing and waning of the moon, my teacher explained why Jews follow the lunar calendar and how this cyclical relationship describes the ongoing relationship that a Jew has with his Creator. There are always ups and downs and yet we are always starting anew. I connected this concept to my many years of struggle and effort to try to find my identity. Tears would well up in my eyes as I listened to many philosophical concepts explaining Tikun Hamidos (character refinement) that were deeply developed in our Parsha (weekly torah portion) class. I must admit, “halacha” (Jewish law) at first frightened me. 613 Mitzvot! A gentile has only the seven Noachide laws. I feared making a mistake and tried to slowly master each concept before incorporating something new in my life. Let me explain my fear – it was a fear of harming my relationship with Hashem by making a mistake. Slowly I began to learn about Teshuva (repentance) according to Judaism. Baruch Hashem!